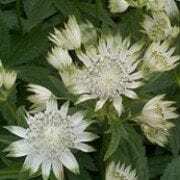 This lovely Astrantia has dark green palmate foliage topped with pincushion flowers in white and soft green. The blooms are held above the foliage on wiry stems and are great for fresh cut or dried flowers. It grows in any good moist soil in a shady border. Easy, hardy and pest and disease resistant. The bonus is Astrantia are attractive to bees and butterflies. Cut back hard atfer the first flowering for a repeat show. Divide clumps in spring or collect and sow seed.